I'm not totally overcome - but my living room floor is. My nice wide open flat quilt laying out space. 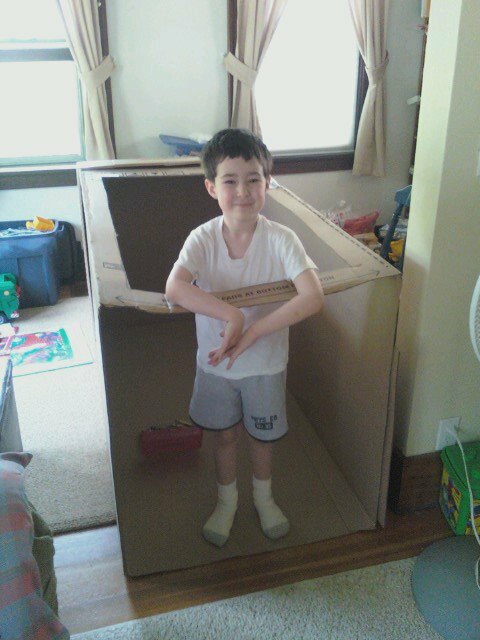 Totally overcome by a whole bunch of Legos and a freezer box. But these are good things!! The Munchkin has been pretty much under the weather since last weekend. Two days home from work with him, and a trip to the Dr. later - we learn it is a virus. Upper respiratory virus with a high fever. Not much we can do except keep him comfortable -which is tough to do in summer heat and humidity with no air conditioning. But we did our best - the fever broke finally - but the cough lingered and really took a lot out of him. He's been pretty content to watch videos near the fan most of the time all week. We did get him outside a bit this weekend - including letting him man the hose for a while (Mommy's big mistake - right between the shoulder blades at point blank range!) and whatever else he felt up to helping with (we were weeding, mulching and planting). He'd fizzle mid day and then come inside to play while we worked in and out to get things done. He's turned it into a town - with a movie theater at the end and drawn roads all down the bottom. I am not sure all else that he has added - but he's loving his box. Of course we now have NO scotch tape left in the entire house!!! And no open floor space. But we have a little boy who is smiling and laughing again - the cough nearly gone - the sparkle back in his eyes. The quilt blocks can wait - I have a town to visit. A few months ago, Lazy Sister Sue and I embarked on our third sister swap - where we pick a quilt pattern, swap a selection of fabric, and then each make our own quilt. This year we included our "adopted" sister Jill, and called it the "Sister Initiation Swap" or SIS for short. This year the pattern is 16 Patch and Pinwheels from MaryQuilts.com - and the decision was made that we would swap white/light strips and each add in our own darks. While collecting my white/lights (mostly whites) out of my stash and from a few shop hops, I pondered long and hard about what darks to add. I had finally used up all but a teeny bit of Wonderland, so that choice was out. I had some orientals - which looked nice with my whites, but held off on cutting them as I wanted to see what fabrics Sue and Jill sent. Scrappy was another option - and with scads of 5" "charms" and 2 1/2" strips in my bins - it was pretty tempting. And then the strips arrived. Regrettably I did not take a photo of them prior to cutting - but lets just say that the selection was "eclectic" - not as many whites as I had - and some really fun lights with different distinctive designs on them. Still stumped on the darks - I started to cut out the lights one night when I was in a cutting mood, figuring I could at least get that ready and set them aside. I cut and I cut and I cut ... and I soon realized that we (Sue) had WAYYY overestimated how much fabric we each needed to swap. 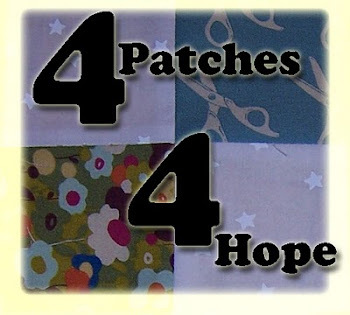 I had cut all of the fabric needed for the 16 patches AND the pinwheels - and still had nearly half the strips left over! I will say that again... nearly half the strips left over. Hmmm.... half..... is your brain going where mine went???? 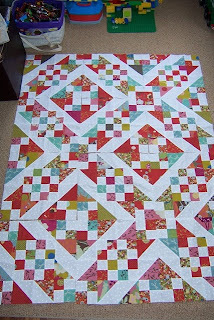 I started looking at the strips again - very carefully - and realized about 50% were WHITE and about 50% were beige/not white... and that, with the addition of a very few extra strips from my stash, I could do this ENTIRE quilt just from the strips we swapped...making a subtle light summery quilt from "Just me and my SIS"... and nothing else (well...not counting potential borders and binding and backing... but you know what I mean). I've kept this secret from Sue and Jill until now... I wanted to see how it laid out. The quilt is growing... actually all 20 blocks are done, but my layout space is currently occupied by some trains and Lego, so I was only able to get 12 out for the photo. I really appreciate Jill's advice on this one to press all the seams open. 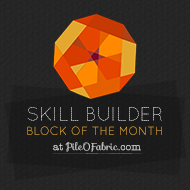 It has made a HUGE difference in bulk and made matching points so much easier. 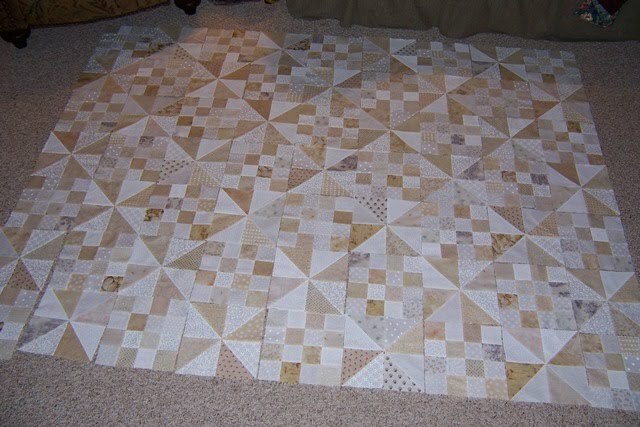 Now to get over to Shellie's and take advantage of her design wall and huge open floor space to really get the whole thing laid out and assemble the rows. Of course my little helper has made all the difference. 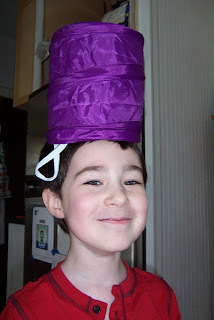 Here he is modeling a fun little pop-up scrap bin from The Gypsy Quilter - of course he thinks it is a great hat, but I think it is just wonderful for all those little bits and pieces that I just can't trim down anymore (I keep 1" or bigger - so don't have a lot left after me and my rotary cutter get done with things.) 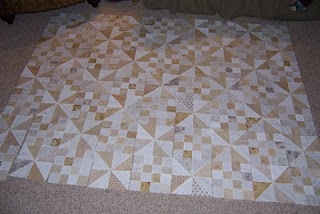 - it also collapses down flat so will be great to pack with me when I head out to sew with others. Hmm - if I get back to my scrapbooking some day I bet it would be good for that, too??! !